See more objects with the color gainsboro darkslategrey darkgrey grey dimgrey or see all the colors for this object. This object was featured in our Object of the Day series in a post titled Experimenting with Type. Imprinted in black upper left: Thematik: Typo-Zeichen / Theme: Typographic Signs / 1) Konrad Bruckmann: Typo-Zeichen als Marke oder Signet / Designed in 1971.72 Typographic sign as trademark or logotype / 2) Konrad Bruckmann: Typo-Zeichen als Marke oder Signet / Designed in 1971.72 Typographic sign as trademark or logotype / 3) Charles Huguenin: Typographic sign as trademark or logotype /Typo-Zeichen als Marke oder Signet / Designed in 1973 Typographic sign as trademark or logotype / 4) Konrad Bruckmann: Typo-Zeichen als Marke oder Signet / Designed in 1971.72 Typographic sign as trademark or logotype / Also in black upper right: Leher/Instructor: W. Weingart / The <Typographic Process> poster series is a published documentation of re-/ sults from the Typographic Class for Graphic Designers and Typographers at / the Kunstgewerbenschule Basle (School fro Design). 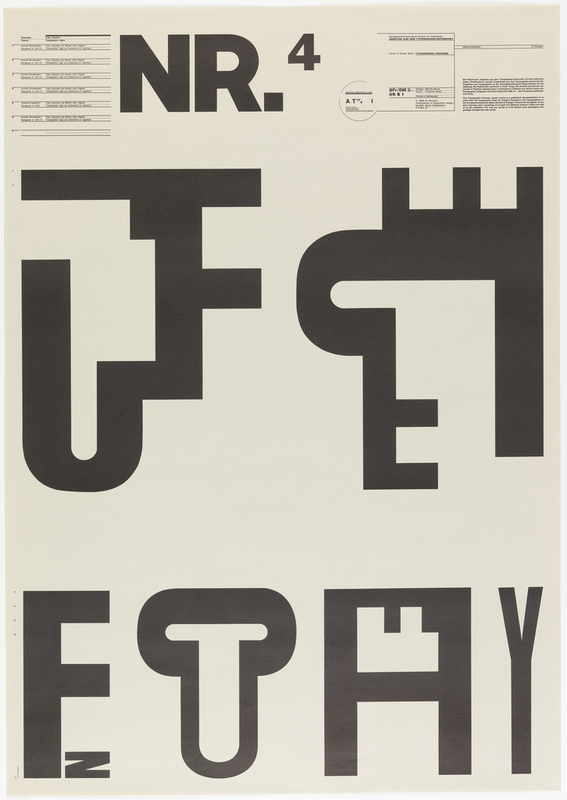 Various series appear at ran- / dom intervals, each consisting of at least five different posters. Orders are tak- / en by the publisher. The cost per series is 5 US Dollars plus packaging and / postal charges (via sea route).